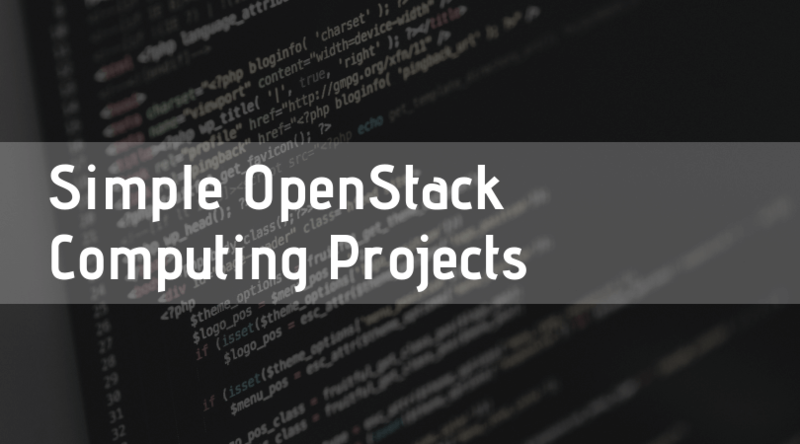 For those who are just starting out with OpenStack project implementation, it might seem like a daunting task to sort through all of the complex features and scalable options that OpenStack offers. You have to define your goals and figure out what you want before proceeding. To begin your OpenStack project implementation, you must determine if you want to use your own software with an in-house team or find a hosted provider to help you with a fully-managed system. There are many options to choose from, and the OpenStack Marketplace and the OpenStack Project Team Guide can help you figure out your needs. Once you have determined your basic cloud-based infrastructure, it is time to take a look at OpenStack sample configurations as well as the various software options that help users begin a basic set-up with the core and optional projects necessary for their initial configuration. So, whether you are choosing architectures for cloud-based web applications, eCommerce, big data, a compute starter, container optimized, or other pre-defined cloud computing systems, OpenStack offers what you need to leverage user-friendly cloud-based architecture. A comprehensive cloud strategy is crucial to leverage the unparalleled agility, efficiency, and innovation of the cloud for your business needs. Understanding computing projects offered by OpenStack helps you implement the proper OpenStack components such as web front-end, compute, network, object or block storage, orchestration, load balancing, big data, file sharing, cloud images, container services and so much more. The Project Navigator and Project Map help users choose what core and optional projects are necessary for their configuration, and a few of the most common include Horizon, Nova, Neutron, Keystone, Glance, Heat, Cinder and Trove. Horizon is OpenStack’s dashboard and provides a web-based user interface that enables management of OpenStack resources, as well as a set of standard tools and templates. Nova configures, deploys, launches and manages virtual machines (VMs) on demand. Neutron is a networking component that handles all IP-based communications through external networks (used by the OS) and tenant networks (customer networks). Keystone is a service that manages identities and user access for high-level authorization and authentication for employees or consumers. Glance is an image service that offers different flavors (images) of virtual machines to customers. Heat is a template-based orchestration system that deploys instances, volumes and other composite cloud applications throughout a data center. Cinder is a Block Storage service responsible for storage management of virtual machine hard drives and used with OpenStack compute instances (Nova). OpenStack’s newest release, Queens, has revolutionized cloud-based architecture, and offers upgraded, advanced tools that provide further simplification and more comprehensive features for virtual graphic processing units (vGPUs), edge computing, containers, network function availability (NFV), high availability (HA), high-performance computing (HPC) and machine learning through artificial intelligence (AI). Cinder multi-attach: a single volume can be attached to multiple virtual machines for redundancy. If one node fails, another can take over without disrupting traffic, which dramatically improves HA. Ironic Rescue Mode: a drag-and-drop option for the creation of orchestration templates, as well as a repair feature for bare metal instances when an Ironic node has been disrupted. RBAC: policies are now registered in project code rather than separate project files. vGPUs: optimizes through provisioning of specific flavors (images), which significantly helps HPC and AI. OpenStack-Helm: provides a collection of Helm charts and tools that install and manage OpenStack on top of Kubernetes and independently runs OpenStack projects as services. LOCI: makes common OpenStack services into Open Container Initiative (OCI) images that can be implemented by a container orchestration tool like OpenStack-Helm. For more release information: see the OpenStack Release Highlights page. OpenStack cloud solutions have a massive support system, pre-configured set-ups and ease of installation. However, implementing a cloud-based solution can become much more complex when your original system needs to be transformed into a more comprehensive architecture, and it is a better choice to hire experienced consultants who understand the intricacies of implementing and maintaining enterprise cloud systems. VEXXHOST’s experts can help you migrate and streamline your existing systems or assist you in creating a new system that meets your needs. We are able to get your OpenStack projects up and running quickly with extremely cost-effective and competitive strategies. You can count on VEXXHOST to provide fully-managed, on-premise and hybrid flexible deployment models for comprehensive cloud solutions that are trusted and highly tested. We are a major part of the OpenStack community as users and contributors, and our experts possess the knowledge and experience needed to identify and work with a wide range of OpenStack infrastructure related issues. Allow VEXXHOST to provide you with an Expert Strategy Session on your next OpenStack project implementation project.